Originating in the eastern Turkish province of Erzurum, cağ kebabı is a controversial dish. The exact location of its birth is a source of perennial dispute, with the cities of Tortum and Oltu both claiming ownership. 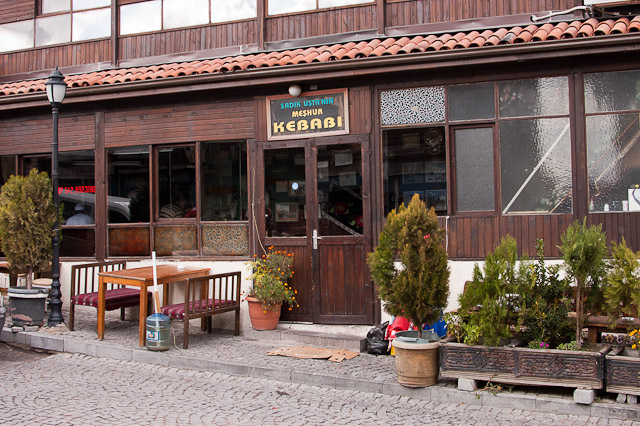 As a result, this particular variety of kebab sometimes bears the name of either city, but also occasionally goes by the less-specific distinction of Erzurum kebabı. Cağ kebabı is different from typical döner in that the lamb is marinated in a mixture of yogurt, black pepper and sliced onion for an entire day before being cooked horizontally on a spit over a wood fire. The result is a robustly flavored meat that combines spice and texture in the manner reminiscent of a Brazilian churrasqueria. Cağ kebabı has the reputation of being a regional dish; I have met several people from Erzurum who insist that it simply cannot be found outside the city and its surroundings. But through a recommendation from the head chef at the very excellent Akdeniz Mutfağı restaurant in the Bilkent Hotel, I was able to find Sadık Usta’s Meşhur Oltu Kebapçısı, located on Atpazar Sk. by the castle in Ulus (Google Maps). In previous posts, I’ve bemoaned restaurants that try to do too much, offering tomes as menus and producing mediocre food as a result. Meşhur Oltu Kebapçısı represents the antithesis of this approach: It prepares only one dish and does it beautifully. Eaten in tortilla-like lavaş bread with onions, pickles, spicy peppers and a tomato-cucumber mix, cağ kababı is a welcomed change from the ubiquitous et or tavuk döner around the city. The prices at Meşhur Oltu Kebapçısı are reasonable, but a bit elevated (by Ulus standards) due to its location next to what is probably Ankara’s only tourist attraction. A sizable meal with a drink comes to about 15TL ($10 at 1.49TL/$). Although Ankara lacks the cosmopolitan spender of other European capitals, the city is not devoid of fine dining. Paper Moon, with branches in Milan, New York, Moscow and Istanbul, is a decidedly upscale establishment worthy of acclaim. Offering Italian cuisine at its very best, this restaurant is sure to please those diners looking for authentic flavors, impeccable service and charming ambiance. Paper Moon’s menu features typical Italian fare: pasta, pizza, meat and fish. It’s difficult to make a bad selection, but the pizza is renown. I sampled the valtellina, which is topped with bresaola, arugola and thinly sliced parmesan cheese. For pasta dishes, my partner was quite pleased with the penne gamberi e zucchine (shrimp and zucchini in a pink sauce). Some words of warning: Beverages are egregiously overpriced. In my experience, up-market Turkish restaurants are notorious for an excessive markup on alcohol, and Paper Moon adheres to this trend with no shame. For example, a $200 bottle of Dom Pérignon goes for a cool 1700TL ($1150 at 1.48TL/$). Even by the standards of haute couture, a 575% premium is a bit vulgar. And sticking to water will not protect you from price gouging. The imported Italian stuff they pour will set you back 12TL ($8) a bottle, and the waiters will assume you want refills. At the end of the night, the 24TL water tab soured the taste of what was generally a very delicious meal. Paper Moon is located on Tarhan Cad. in the posh Kavakıdere section of Ankara (Google Maps). Entreés range between 20 and 50TL ($13 to $33).